When was the last time you thought “I need some rocking Bassoon?” Yeah, me either. So it is incredibly surprising to find that I am so hooked. An already hugely successful Kickstarter campaign has The Breaking Winds Bassoon Quartet (BWBQ) well on their way to recording their debut album. At Eastman School of Music, Yuki Katayama, Brittany Harrington, Kara LaMoure and Lauren Yu found a common passion in 2008; a passion of being serious about fun music. Fun music is what they have achieved. BWBQ is the music you never thought you’d be hooked on. 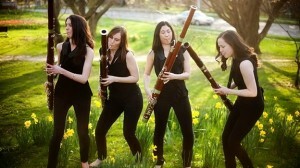 They don’t just play classical music like we’ve heard for decades, they make the Bassoon cool. Adding their spin to songs from Tchaikovsky to Coldplay to Radiohead to Lady Gaga and beyond, these four gals are infectious, fun and captivating. Blonde wigs and choreography add to their live performances. All around eye-opening and superb timing make each song unique and fun. 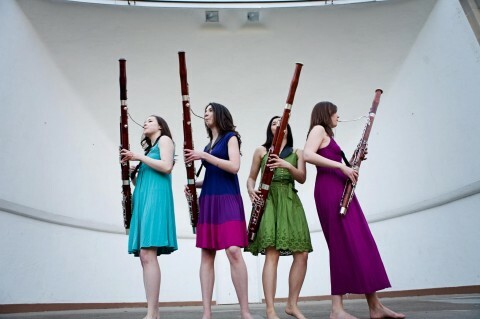 Though they don’t have a full professionally recorded album The Breaking Winds Bassoon Quartet’s is no less impressive. The ability to mesmerize you with the limited YouTube recordings they have draws you in and won’t let go. Surprisingly not yet viral, each song is refreshing and snares your attention. Even though they’ve already hit their Kickstarter goal, this is one group we support and so should you. This entry was posted in Other Great Stuff! and tagged Bassoon, Breaking Winds Bassoon Quartet, Brittany Harrington, BWBQ, Eastman School of music, Kara LaMoure, Kickstarter, Lauren Yu, music, nanobot, review, youtube, Yuki Katayama by Greg. Bookmark the permalink. You guys are terrific. My wife works for a presenting series at an Arts Center in NH. Maybe I can get them interested in booking you. What’s your agent? Hi Daniel! I’m a member of The BWBQ and we’re definitely interested in finding out more information. How can we get in touch with you? 🙂 Thanks so much! I know you have lots and lots of supporters now, but I hope you will send out a notice when your CD is ready to sell. I would very much like to buy one. Break a leg!